When asked to recall a poem or a song from childhood, I recall the above verse from The Walrus and The Carpenter by Lewis Carroll. (For the sake of understanding this piece, it may be beneficial to read or skim the full poem). These words take me straight to the scene from Alice’s Adventures In Wonderland where Tweedledee and Tweedledum recount the tale of the Walrus and the Carpenter walking side by side as the little, helpless oysters, trail behind them. As a child listening to the sing-songy tune of the poem’s iambic pentameter, I could not help but feel disturbed by the themes of trickery and selfishness strewn across the poem. Yet, there was no reason to address or overthink any of the negativity in the story. While this poem bears a heavy load and to the literary critic, demands to be unpacked, it is actually dripping with intentional nonsense, and maybe that’s the way it’s supposed to be. While some may say this poem is the very reason your mother told you not to play with your food, I find myself caught up in the nonsense of the story itself. What is the significance of the Walrus and Carpenter, and what exactly brought these two characters together? Why is the Carpenter the only human in the story? 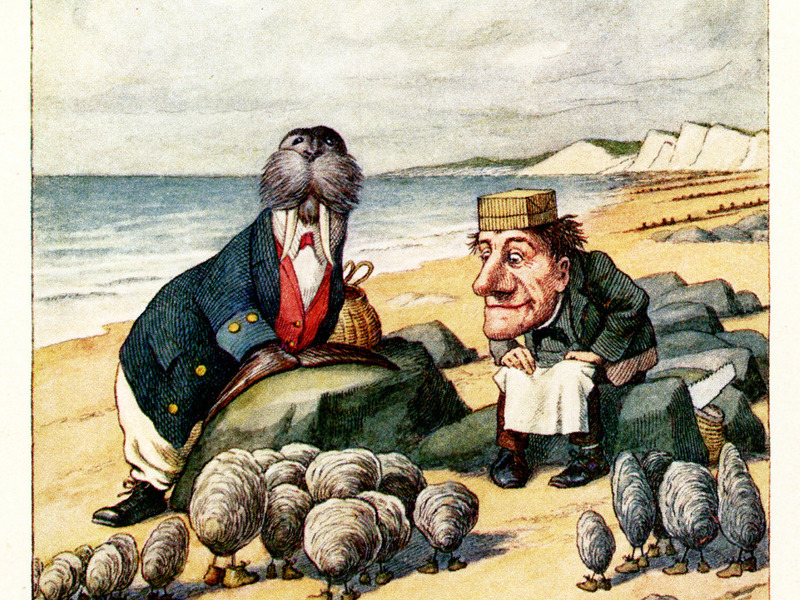 And why does he lack the morality to tell his animal counterpart that it isn’t polite to con small creators into “joining you for dinner?” And why is the most nonsensical verse of all the one that convinces the oysters to leave their warm oyster beds for an unfortunate demise? Even more so — why does the wise oyster let the young oysters go in the first place? Why didn’t he/she put up more of a fight? The sun and the moon shine at the same time as Carroll states ironically that yes, the sea was very wet, the sands “dry as dry.” The birds are absent, perhaps because birds do not often fly at night. The clouds are absent, perhaps because there aren’t often clouds when the sun shines its brightest. Amongst these contradictory clauses, the author introduces this unlikely duo with no further introduction. Of course, the fact that they’re walking “close at hand” establishes a sense of closeness in the relationship. One does not walk close at hand with just any walrus. No literary critic can argue the nonsense of this stanza. At this critical moment, the reader is forced to give in to the ridiculous situation Carroll has presented. This poem epitomizes nonsense literature: a literary genre which combines elements that make sense with those that do not. By skewing the logic and natural expectation of the reader, one is left not knowing what to expect from the work. We find these ideas most notably in children’s stories, fairy tales, and nursery rhymes. Children’s stories are filled with nonsense, almost definitively. We see eggs falling off of walls — a tisket here, a tasket there, and three or so blind mice. When it comes to these stories, if it rhymes, it works. This may be the rule with the Walrus and the Carpenter as well. In the Annotated Alice, coauthor Martin Gardner tells the story of the Carpenter’s fruition. When Lewis Carroll gave his manuscript to illustrator John Tenniel, he gave him the option of drawing either a carpenter, a butterfly, or a baronet — as each word would fit the poem’s metre. Rumor has it that it was not Carroll who chose the Carpenter, but Tenniel. Therefore any symbolic interpretations of the Carpenter are rendered null. The Carpenter offers no significance to the poem other than his three-syllable convenience. This begs the question: what else may be this way? Yet, as adults, we’re forced to recall these hazy tales that drip with nonsense and jest as staples of our childhoods. What can we make of this? Are we meant to shut off our overly critical minds and simply bask in the nonsense? Is it possible to enjoy a story at face value without wondering what the author was really trying to tell us? Perhaps this is the literary world’s way of telling us not to take life too seriously. Sometimes it’s okay to sing along to a song even if we don’t know exactly what the words mean. We must keep our curiosity at bay and find comfort where we are in the story, lest we find ourselves eaten for dinner.